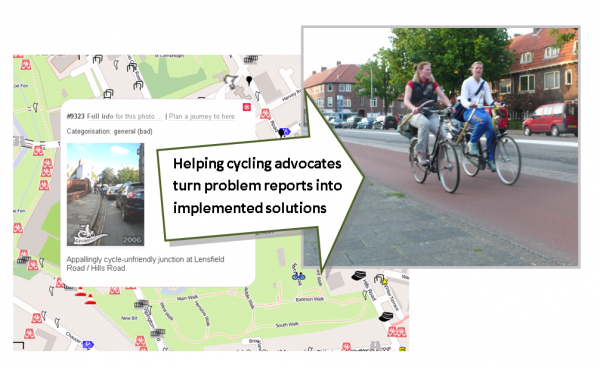 As we announced recently, CycleStreets is one of the winners of the GeoVation contest, with our bid for a comprehensive online campaigning toolkit to assist cycle campaign groups around the UK. The first phase of this project is finalising a specification for the toolkit. Here is the description of what it will do. This outlines what the toolkit will do, how people and groups will be able to use it. The full specification also has a prioritisation of these features. We warmly welcome comments from groups around the UK on this draft, and will be publishing a further more finalised draft, incorporating comments received, in a week's time for our deadline of 24th July. Please do contact us to give us your views. We've tried to include as many of the ideas we've received and come up with as possible. We hope the attached draft will give cycling groups an idea of how much the toolkit will assist their work. We hope also its themes of bringing campaigners together and, where possible, involving Local Authority contacts will help usher in a collective spirit of work to improve cycling conditions around the UK. When we did a survey of transport issues in one part of Oxford ( http://www.cyclox.org/what-we-say/around-the-city/west-oxford/ ) we found quite a number where cycle and pedestrian and bus-stop-access issues interacted, so there might well be a value in allowing issues to be broadened to cover things from their viewpoints as well. There's not much point finding a mono-modal solution that just sets cyclists against pedestrians. I am writing from the perspective of a large Cycle Training Provider working in London and the South West. I would like the toolkit to be available to groups other than campainging groups. The cost of similar commercial mapping products is out of range most CT providers. We, and i am sure many others, have a requirement for mapping of suitable CT drill locations near to schools and snaking routes. We are also interested in measures that may increase the likelihood of school age children cycling to school. For instance the distance that can be cycled by a parent and or a child using level 2 of bikeability routes. Or the distance that can be cycled without crossing busy roads, i.e. roads with speed limits greater than 30 mph. I believe datasets like these may be already be available but if it was easy to integrate into the toolkit it would give those of us are engaging with local authorities on these issues an equivalent level of easily accessible information. I am happy to go into greater detail if this is of interest. I've looked through the detailed spec document now and it looks fine to me. One great advantage I can see is that it'll potentially help balance out the workload within our cycle campaign by allowing the latest status on any particular issue to always be seen on the system. Getting more campaign member involvement will also help with our committee's workload. I like the push/pull options of mail list and forum. Can't think of anything you've missed. I'm hopeful that this will encourage common issues to do with rules or conventions to float to the top and be tackled at source.